Thanks to our combined efforts we’ve provided nearly $2,000 of scholarships in 2018! Recognizing that many who would benefit from our programs have very limited resources, we began a Benevolent Art Fund in 2013 to help provide scholarships for senior adults in our community. We underwrite full and partial scholarships by donating a portion of our profits, and inviting others to partner with us through grants, memorial gifts, and sponsorships. 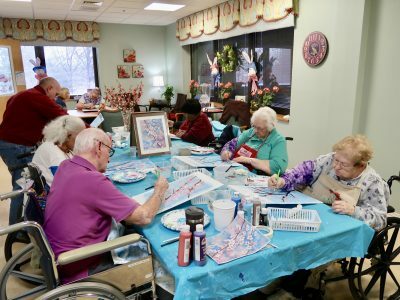 We greatly appreciate your thoughtfulness and generosity in helping us spread life-giving joy in our neighborhood and senior living communities — one painting at a time! Click here to make a gift via PayPal, or click on the donate button below. Please contact us if you have any questions, or wish to make a gift using another method.